Exterminate! Exterminate! That would be the ringing “endorsement” from the Daleks as they move around. Well, if you are a huge fan of Doctor Who and would want to ensure that your little one also follows the kind of series that you like, how about starting him or her off young? 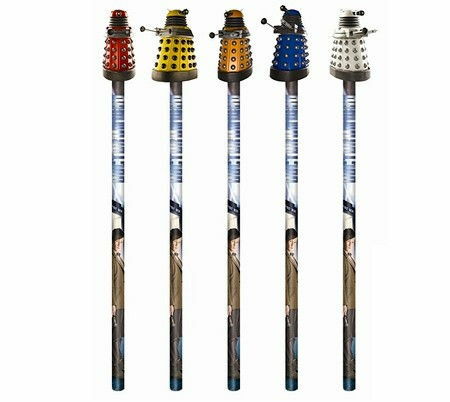 After all, there is nothing quite like a pencil topper to capture his or her attention, and you might as well do it with the $4.99 Doctor Who: Dalek Pencil Toppers. These pencils would come with a different colored Dalek on a graphic Doctor Who Pencil, making it an awesome collectible that might just be too precious to use. Underneath each Dalek lies an eraser just in case you make a mistake. After all, you are unable to travel back in time to change the past, but you can do something about it physically.